Latest Pursuit has launched a Kickstarter campaign for their new board game The Oleg Story: Survival. 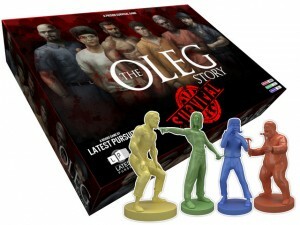 The Oleg Story™: Survival is a prison based board game. The story is based on Oleg D Tyler. He is an international hacker who is believed to have been captured and handed over to the U.S. Government, suspected of leaking confidential governmental information. Oleg has been incarcerated in one of the most notorious prisons in North America and stands accused of killing two innocent people. Oleg has been sentenced to serve two life long prison sentences. He has refused to join any organised gang. For a full, in depth back story then don't forget to check out the back story DVD; see pledge levels for further details.